Use spices to reduce sodium intake! 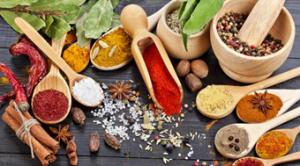 ACC FriscoUncategorizedUse spices to reduce sodium intake! New research suggests that people find it easier to lower their salt intake if they’re taught how to use other spices, providing a potential public health strategy for limiting health complications of excessive sodium. The study, which was presented at an annual conference hosted by the American Heart Association, followed 55 volunteers involved in a two-phase experiment spanning 24 weeks. At the start of the study, more than 60 percent of them had high blood pressure, and about 18 percent reported diabetes or weight problems. For the first four weeks, all participants followed a low-sodium diet put together by the researchers. For the remaining 20 weeks, participants were either asked to lower their sodium intake on their own or partake in a behavioral intervention program designed to educate them on low-sodium eating. The sessions focused on ways to substitute salt with herbs and spices when cooking. Anderson and her colleagues found that, although sodium intake went up for both groups following the initial four-week intervention, those participating in the behavioral sessionsate significantly less salt over the 20-week period. On average, they consumed nearly 1,000 daily milligrams of sodium less than the control group. “People in the intervention group learned problem-solving strategies, use of herbs and spices in recipes, how culture influences spice choices, how to monitor diet, overcoming the barriers to making dietary changes, how to choose and order foods when eating out and how to make low-sodium intake permanent,” Anderson explained. The results dovetail with a number of other studies highlighting the benefits of bringing a more diverse range of spices into your cooking. One example is a recent paper from the University of Kentucky, in which researchers show that curcumin — a compound occurring in curry — may slow the growth of breast tumors.